Instead of watching from the outside, Luxcore users can jump right in and start having a direct hand in the Luxcore ecosystem’s distributed consensus and function. 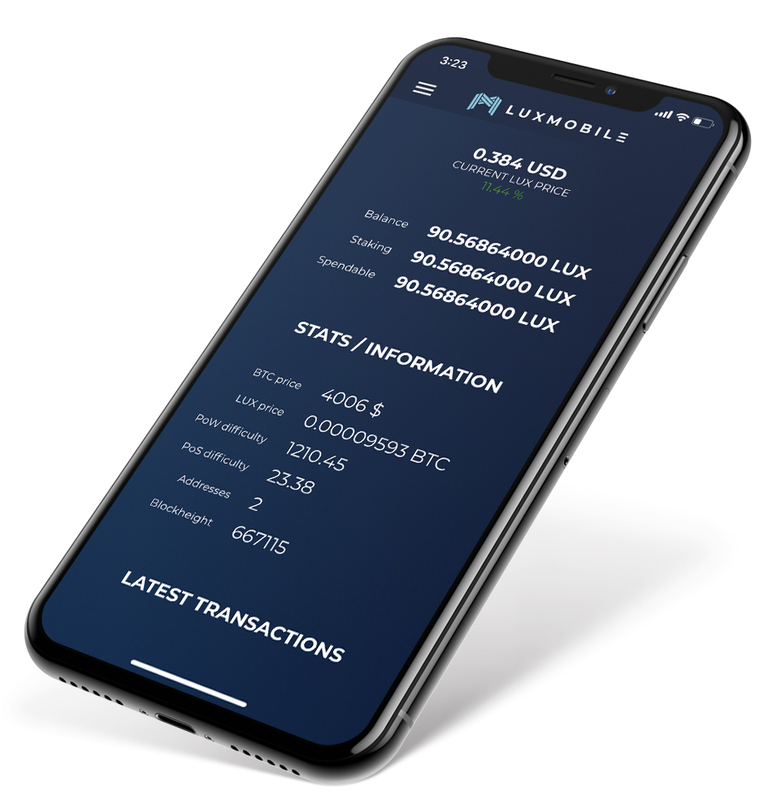 Settlement and execution of Luxcore storage and transactions are now literally at your fingertips, enabling you can send and receive LUX on the go, all the while remaining confident that your funds and information are protected. 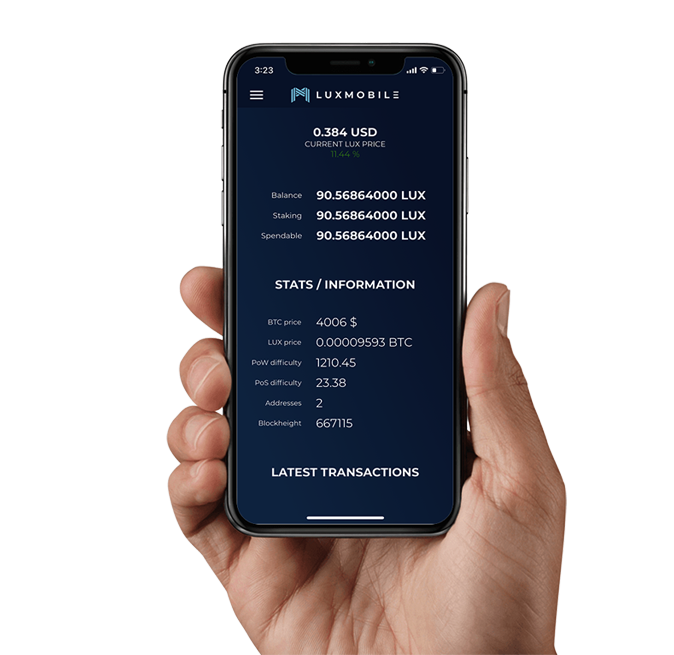 Coupled with extremely high degrees of decentralization - through the deployment of both Amazon Web Services (AWS) and numerous parallel nodes - and increased control for LUX users - through user retention of their private keys - and there’s no wonder why the LUX PoS mobile wallet is the perfect wallet for LUX and crypto users of all backgrounds (novice, expert, or somewhere in between). Not only does Luxcore’s PoS mobile wallet leave a smaller carbon footprint than other traditional PoS web wallets - through it’s employment of the PHI2 hashing algorithm - it also authorizes users to generate LUX stakes without having to run their computers 24/7. LUX users are now able to stake LUX on the go, without ever having to worry about tending to their computer. Do note that if users send LUX Coins to an address which already exists with a web wallet, they will need to wait for 36 hours for maturity before staking commences. However; if users import their private key to the web wallet, with already matured LUX Coins, then one may start staking within just two hours. As opposed to dynamic rewards staking systems utilized by a large percentage of PoS blockchain projects, whereby users are rewarded based on the amount of coins a user holds, Luxcore approaches payouts in a more equitable manner, instead opting for a static staking rewards system. Users may also enable email and mobile notifications for new stakes, to be alerted anytime new LUX is earned. Users can also authorize push notifications to their phone when they receive a stake. Furthermore, like the PoS web wallet, PoS maturity is reached within merely thirty-six hours, so LUX users are able to start staking LUX for free almost instantaneously. One of the most impressive and revolutionary security features of the LUX PoS mobile wallet is the ability of LUX users to remain in complete control of their private keys. Luxcore users can import and export their private keys directly with the mobile wallet, instead of ever having to send funds from wallet-to-wallet. This ultimately cuts down and saves on network fees. Additionally, when LUX holders are finished using a mobile wallet address, they’re able to export and delete their private key from the server. All you need to do is select the address you want to export or export and delete, enter your respective authenticator code (if ultimately enabled), and voilà, your private key is now deleted from the server along with all corresponding addresses. Email verification is also available when exporting private keys, resulting in increased security and surveillance of funds. That’s not all. 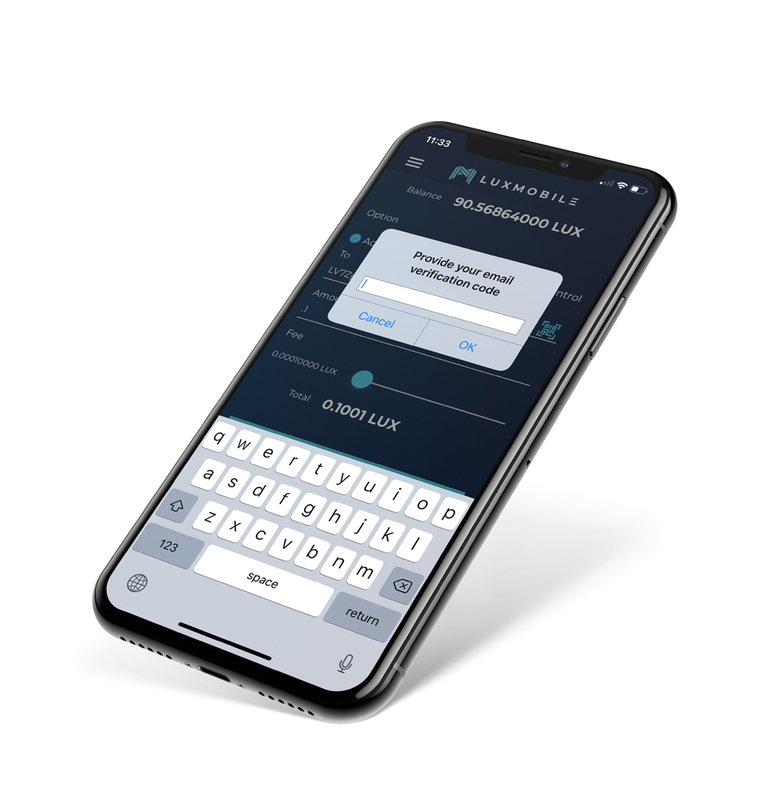 The new LUX PoS mobile wallet also boasts two-factor authentication (2FA), so users can implement an extra security barrier for accessing funds. When utilizing 2FA, we generally recommend opting for Google Authenticator or Authy and other time-based code applications, rather than SMS, as there have been several high-profile breaches of SIM swapping in the past few years. Do note that SMS 2FA is not supported for the Luxcore PoS mobile wallet. Luxcore users can rest assured they’re in complete control of their LUX funds when sending and receiving LUX Coins. All crypto wallet users should be able to control their transactional footprint, meaning some users might want to avoid giving other LUX holders a direct look into their total balance and transaction history. • Email verification to secure their transactions on the mobile wallet. Luxcore mobile wallet users may turn on email, face, and fingerprint verification for all transactions, enabling LUX users to verify all outbound transactions before they are finalized. Users will also receive real-time log-in alerts in case a malicious third-party has accessed their account and is attempting to send funds. Luxcore’s ‘Advanced’ sending option merely requires LUX senders to input the intended recipient address, along with the amount of LUX to be sent. Fees are automatically calculated, authorizing a quick and painless transaction. LUX senders may also utilize the ‘Coin Control Option’ to select which addresses they’d like to send their LUX Coins from. Most notably, users are able to select the precise address within one’s wallet to send LUX Coins from, and distribute the amount sent across several addresses. 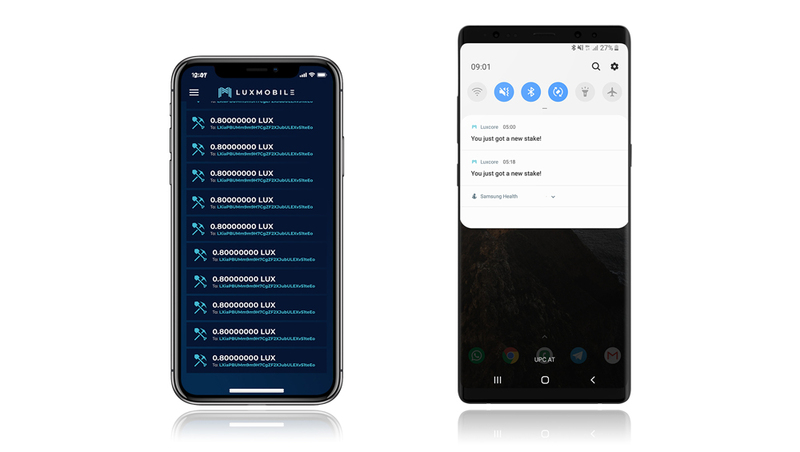 Finally, when sending funds, the LUX mobile wallet will always strive to send the minimum amount of coins needed for the transaction, so that a user loses the minimum amount of staking coins and does not have to wait for them to re-mature for 36 hours before staking again. The Luxcore PoS mobile wallet for Android/iOS is the tool the blockchain world has been waiting for. At the forefront of a range of mass-adoption-ready features is the wallet’s ability to earn users staking rewards on the go! As well as leaving a smaller carbon footprint than other traditional PoS web wallets through its employment of the PHI2 hashing algorithm, Luxcore’s static staking system is fair. Instead of rewarding users based on the amount of coins they hold, Luxcore’s static staking system rewards all users equally – simply for holding matured coins in the wallet. Email and mobile push-notifications that alert users of new stakes, provide an experience users expect from high end tech companies, but that they don’t find with most existing cryptocurrency solutions. Furthermore, like the PoS web wallet, PoS maturity is reached within merely thirty-six hours, so LUX users are able to start staking LUX for free almost instantaneously. Perhaps even more important though, are the revolutionary security features of the LUX PoS mobile wallet. Users maintain complete control over their private keys at all times, and can even import and export their private keys directly with the mobile wallet, instead of ever having to send funds from wallet-to-wallet. Users can choose to delete unused private keys completely from the server and Email verification is available for all private key exports so security is never compromised. The Luxcore PoS mobile wallet also boasts two-factor authentication (2FA) and users will receive real-time log-in alerts for maximum peace of mind. The design principles behind the wallet are centred around giving users complete control of their funds, at all times. This is particularly true with transactions. Luxcore mobile wallet users may turn on email, face, and fingerprint verification for all transactions, enabling them to verify all outbound transactions before they are finalized. There is also a built-in ‘Coin Control Option’ so users can select which addresses they’d like to send their LUX Coins from, and even distribute the sent amount across a range of addresses. The ‘Advanced Sending’ option makes sending LUX incredibly easy. All users need to do is input a recipient address, along with the amount of LUX to be sent, and the wallet will take care of the rest – including automatic fee calculation! While easy-to-use Luxcore mobile wallet is set up for mainstream adoption, there is still plenty to excite the blockchain purists. With extremely high degrees of decentralization - through the deployment of both Amazon Web Services (AWS) and numerous parallel nodes – the mobile PoS wallet gives Luxcore users the ability to jump right in and start having a direct hand in the Luxcore ecosystem’s distributed consensus and functions. The Luxcore PoS mobile wallet is available to download now from the Apple App Store, and Google Play. It takes seconds to set up, moments to learn and even un-matured coins will be staking within 36 hours. The perfect on-the-go secure wallet solution for users of all experience levels! Are you a coin developer? Interested to add value to your project with our Mobile Wallet? Leave your information!